This afternoon I had the pleasure and privilege of talking over the phone with Eric Booth, one of the most inspiring arts advocates I know. Eric’s definition of art is very different than the “art world” definition, which is exactly what makes him unique and inspiring. Eric goes to the root of the word “art”, and reminds us that art simply means, “to put things together”. Basically that art is a VERB less than a thing – it does things, it moves things, it is not simply a thing. This is a profound idea that has implications way beyond the art world, which as we know is tiny. 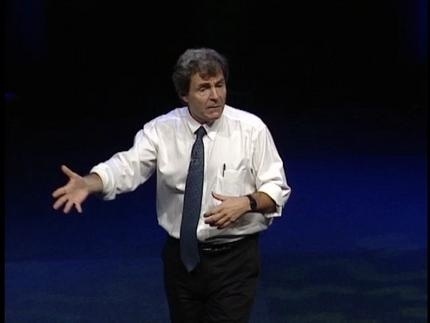 I first heard Eric Booth talk years ago in San Francisco; I believe he was talking to a group of business folks and administrators. It was one of the most refreshing talks about art I had heard in years – he basically made the case for art and creativity in all things, business or otherwise. 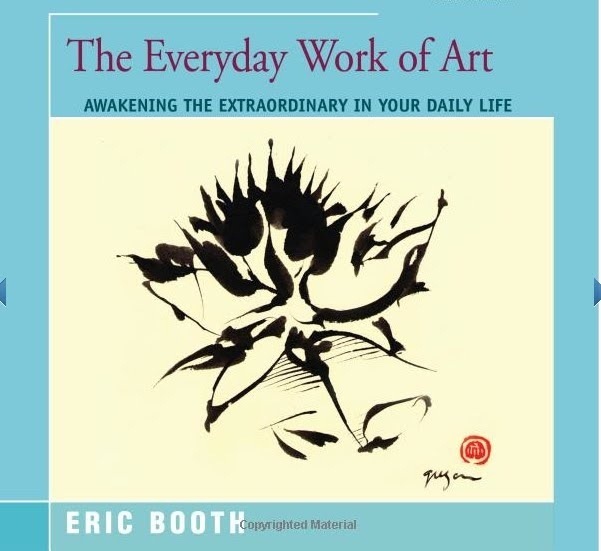 Afterwards I bought his book, “The Everyday Work of Art“. The book is a gem – he eloquently and dutifully erases the lines and boundaries we’ve created over the years about what “art” is and what “art” should look like. After reading the book, you are inspired to see all of your life as art, all of your business affairs as art, and all of your relationships as art. Mind you he does not do this in a romantic way, it’s actually very practical and insightful – a handbook on how to drop the “this or that” outlook” on art, and replace it with the “this AND that” outlook. This book was written in 1997, when Daniel Pink (the right brain evangelist) was still writing speeches for Al Gore. Eric was born in Mid-town Manhattan, and then moved into the suburbs. He lived in New York City throughout his adult life, and moved out to the Hudson River Valley 15 years ago. He started his career as an actor, and then he engaged in schools as a teaching artist. Then he started a business. During the summers at this time he used to go on wilderness trips. On the wilderness trips he recalled he used to talk to the other hikers, some of who were business people, and asked if they ever heard of some interesting business ventures to look him up. Shortly a business venture popped up, and he used his life’s savings to purchase a business, Alert Publishing. He started out with one colleague then grew to a healthy 13 on staff. The company analyzed research on trends in American lifestyles and published newsletters, books and reports. He became a major figure in trend analysis, frequently quoted by the major media with interviews often appearing in The New York Times, The Wall Street Journal and elsewhere. He appeared as an expert on NBC News, Sunday Today, and several times on CNN. After seven years he decided to sell the company, as he felt he was not invested enough to take it to the next level. Throughout his time at Alert Publishing Eric continued to pursue teaching artist gigs, which his employees would refer to as his “secret life”. While he didn’t have any interest in returning to the life of an actor, he remained curious and engaged with teaching artistry. After he sold the company he took a sabbatical, moved to the Hudson River Valley and wrote his seminal book “Everyday Work of Art”. After writing the book, he then began to engage more fully in arts advocacy and general advocacy for the teaching arts. He admittedly started hitting walls on arts education avenues he was pursuing. If anyone has tried to work within the arts education community in America whether in public schools or non-profits, you understand this avenue is very steep and trying. Feeling frustrated he decided to pause and take stock. He then traveled to rural Tanzania to work with community children to write plays, then to Venezuela where he learned about the El Sistema movement. He has continued working with El Sistema, and is on their National Steering Committee as lead teaching artist and trainer of teaching artists. 2. A trend in marketing savvy – the art industry is steeped in marketing as much as big business nowadays. So this mix of art club and marketing think causes grantmakers to design their applications to fit this thinking, and causes big headaches for artists. I plan on writing to the Grantmakers in the Arts per Eric’s suggestion, to let them know that forcing artists to think this way is deepening the crevice between the art club and the general public, AND it’s requiring artists to put some pants on that just don’t fit. On the topic of audience building Eric clued me in on an AMAZING program he founded that is working with orchestras, specifically with orchestras and how to build brave new audiences. In short he and his colleagues have created the Orchestra Engagement Lab, a week long intensive for entire orchestras in Vermont in the summer. In 2012 they gathered Orchestra administrators, educators and conductors from California, New York, Massachusetts, New Jersey, Texas, Ohio, and Vermont together with the Lab’s teaching artist staff, composer Kenji Bunch and electric violin soloist Tracy Silverman. The result of the intensive period was a commissioned work, plus tried and tested community engagement projects to go along with the new piece. Basically this Summer Academy is meant to create collaboration and innovation across all organizations present AND devise a plan to have the new work reach new audiences. This type of brainstorming and applied collaboration is unheard of, especially with orchestras whose funding seems more precious every year. I look forward to learning more of the commissioned pieces each summer. Bravo Eric, in the truest sense of the word! In closing I wanted to ask Eric about his thoughts on the US government’s role in arts, and his thoughts on what he wished the media would start talking about vis a vis the arts. In his lifetime he doesn’t see much change happening on the US government’s support on the arts. He remarked that changes in the geology of arts will happen, if and only if arts institutions completely redefine their outreach and programming to reflect genuine engagement with the community. He used the term “change or die.” Gulp. He did point out some hopeful beacons of organizations that have in fact done that, namely the Walker Art Center in Minneapolis, Minnesota, and the Woolley Mammoth Theatre Center in Washington, DC. When I asked him what he wishes the mass media would talk about vis a vis the arts, he hopes that the media would talk about the artist as engager, and about the connecting process between the arts and creativity. While there is a lot of talk about the arts and how it is effective in creative thinking, talking more about the process is where the magic is. In the 60’s an ambitious project launched called Experiments in Art & Technology (E.A.T.) founded by engineers Billy Klüver and Fred Waldhauer and the artists Robert Rauschenberg and Robert Whitman. I remember coming across the archives 5 years ago on the web and being blown away. Basically from 1967 – 1973, 10 New York artists worked with 30 engineers and scientists from the world renowned Bell Telephone Laboratories to create groundbreaking performances that incorporated new technology. Unbelievable and exciting right? The sad fact of this amazing project is there was no interlocutor – or to use a less fancy term, there was no one in the middle connecting the two ways of thinking. If this project was restated next week, Eric would implore there be a teaching artist or artist catalyst (as his Australian colleagues prefer to call it) in place. That way the richness of the creative process would not be lost, but documented and translated into meaningful information. Again, if art means to “put things together” – an artist would need to be supplanted to in fact do this – to put the pieces together and make sense of it for all. Right now the E.A.T. archives exist as a list primarily of the artists’ proposals, the engineers they were paired with, and when and if the performance took place. The visibility of the creative process is missing from the documentation. Today still artists are involved in an impressive amount of community endeavors, but the visibility of the artists and their creative process is continually overlooked by large institutions. Eric cited a LINC research report from 2003 showing that 87% of Americans believe that art contributed to culture, but only 27% believed that artists contributed to culture. Eric sees clearly that artists are uniquely potent in community projects (e.g. schools, the justice system), so why is our perception of artists so low? Eric suggests that as artists we need to become more clear and confident on what we know, and move into thinking outside of the medias we are used to. With that in mind, I’m off to design and dream about the Trojan horse to be built – one that can spread the word of what art truly is (the intersection, the gap)…thanks for the inspiration Eric (and Rauschenberg for the gap)! Thank you Catherine! Inspiring, thought provoking, well written, and a great interview. Would love to talk more about the notion of audience. Not sure I was clear about what I was saying the other day.